The Historic Centre of Mexico City and Xochimilco represents the historical continuity from the city as Aztec capital to the capital of New Spain. 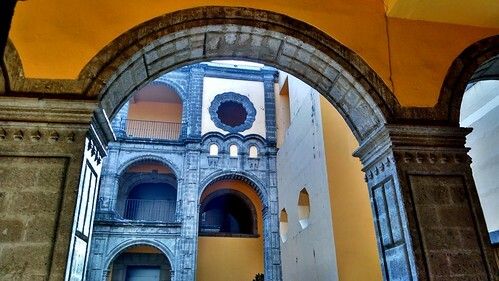 The area in the Centro Historico includes an Aztec archeological site, Spanish colonial constructions and 19th and 20th century public buildings. One of the biggest cities in the world today, Mexico City was built in the 16th century by the Spanish. They did so on top of the ruins of an old Aztec capital, Tenochtitlan. They added their own colonial churches and public buildings on a checkerboard street plan. The major remaining Aztec monument is the Templo Mayor, its foundations dating from the 14th century. The temple was dedicated simultaneously to two gods, Huitzilopochtli, god of war, and Tlaloc, god of rain and agriculture, each of which had a shrine at the top of the pyramid with separate staircases. The site was only rediscovered in 1978. Xochimolco is a city 28 kilometers to the South of Mexico City. There a network of canals and artificial islands can be found, built by the Aztecs. Although I had been there before, I count my trip of 2014 as my first proper visit to Mexico City. From my earlier trip I only remembered the Zocalo and some unremarkable grey buildings. This time I wanted to taste something from each period: the Aztec Templo Mayor, the Spanish-colonial Cathedral and the 20th century Palace of Fine Arts and Diego Riviera murals. I started my day of sightseeing at the Zocalo. It was the scene of a demonstration, as on most of its days. To my surprise though the middle of the square had been turned into a Winter Wonderland, where Mexicans rode sleighs from an artificial snow slope and (even more funny when you're Dutch) tried to master an ice skating rink. The Cathedral provided a much needed place of quietude. I liked its facade (and that of its neighbour Sagrario Metropolitano), which is a text book example of the Churrigueresque style. 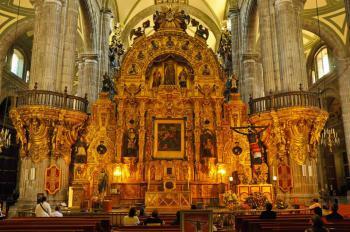 The interior is extremely baroque too, with lots of gold and bleeding Christ statues. It's worth a look, but both Cathedral and Zocalo would not get my vote for WH status. The historic center is 'just' a working city with many modern buildings too. I think it has more Starbucks cafes than there are in the Netherlands in total. I could not remember whether I had visited the Templo Mayor on my previous visit. But after I entered its gate I was sure that I mysteriously had missed out on that in 1997. To me it is THE highlight of the city, and worthy of WH status by itself. Somehow I had always thought that the remains were just some piles of archeological rubble. But several original statues, reliefs and temple constructions can be seen in situ, some even in their original colours. All have information panels in both Spanish and English. It's a lovely site with an entrance fee of a mere 3 EUR, which includes the excellent adjacent museum. The museum probably is even better than the archeological site itself: in bright and modern presentations, it shows the found objects of the Templo Mayor in 8 exhibition rooms. I don't think there's a single uninteresting object among them. I had a good day already, but I wanted to finish it with some of the famous murals. First I went to the Palace of Fine Arts. Although it was possible to enter the main (art nouveau) hall, the rest was off-limits to me. The murals are not on display at the moment and covered by plastic. 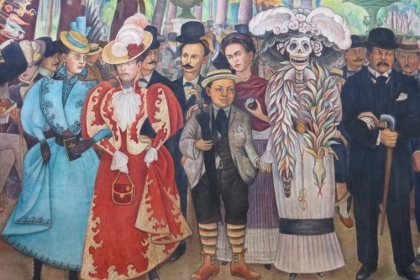 Fortunately I got another chance nearby: at the Museo Mural Diego Riveira his 'Dream of a Sunday Afternoon in the Alameda Central', portraying figures from Mexican history, is shown. I had the masterpiece all to myself, and spent some time checking out 'Who is Who'. We really enjoyed Mexico City; we spent seven nights here split into two batches, yet still felt there was more we could see. Perhaps our highlight came on our first night, fresh off the plane we went for a stroll from Paseo de la Reforma into the historic centre. It was a Saturday night between Christmas and New Year as such we seemed to have been joined on our amble around the world heritage site by every other inhabitant of this massive metropolis. The incredible family friendly atmosphere was really special; the glorious ambience in Alameda Park even managed to upstage the beautiful Palacio Bellas Artes. The next day was mostly devoted to murals, a most astonishing artistic response to the political climate after the Mexican Revolution. There are innumerable examples around the city; the staggering quantity in the department of education impresses, the quality at San Ildefonso is very high, with Diego Rivera's early 'Creation' in the theatre being my wife's undoubted highlight of the whole genre. 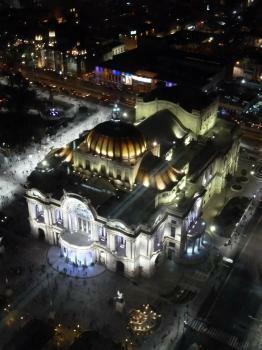 For me it was the incomparable Palacio Bellas Artes that really had me giddy with excitement. It is a building that could comfortably be an excellent world heritage site by itself, especially if you include its sibling across the road the Palacio Postal. The architecture and finishing details are magnificent, and the murals were exceptional. The highlights were Siqueiros' Torment and Apotheosis of Cuauhtemoc, a glorious artistic piece of nation building, though even that was over awed by Rivera's 'Man, Controller of the universe'. A wonderful take on early 20th century politics, even if you may view some of its ideas as naive it is pretty hard not to be impressed by its energy. Just when I thought I had covered all the best bits I paid a visit to Templo Mayor. The archaeological remains of the Aztec temple were pretty impressive, but the story told by the brilliant onsite museum elevated this to something really special. There aren't many cities that have such significant remains of two distinct cultures in such a central location. The bulk of the central streets of the Historico Centro may just seem like a grey grid of department stores and windswept plazas but having the time to delve a little deeper really opened it up. I even started to see parallels with bits of Chicago in the store fronts, and hidden stained glass gems. On top of these sites Mexico City also had wonderful food, from the budget treats of Taquería Los Coyuyos, specialising in nose to tail meat tacos or slightly more standard empanadas from Pastelería Madrid to the higher end dining of Azul Historico, the food really impressed. My wife also pulled her special trick of hunting out some lovely districts to while away the evenings with Roma and Condesa being our favourites. Mexico City ended up being much more enjoyable than I had expected, the sheer depth of attractions from multiple periods of multiple cultures really rewarded an extended exploration. The Aztec remains when twinned with the twentieth century murals provided two world class attractions on top of each other. 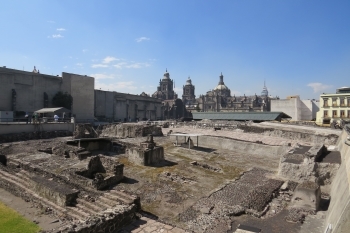 Most reviews have covered the Zocalo, the Palace of Fine Arts, and Templo Mayor. However, I noticed no mention of the Regina Cultural Corridor (Street) which is clearly included in the 2014 Map of the inscribed area. Indeed, I personally found this street one of the most interesting areas to explore in the historic district. The atmosphere was vibrant, the restaurants/cafes are quite good, and the corridor is littered with historical structures. Moreover, unlike the Zocalo, the street is not particularly catered toward tourists, and is frequented by locals. Based on the 2014 map, it seems the Museo Diego Rivera, which includes his famous mural are not part of the inscribed zone. However, the Secretaria de Publica (Mexico City) is part of the inscribed zone, which also contains significant Diego Rivera Murals. Unfortunately, I walked to this building, but it was closed. 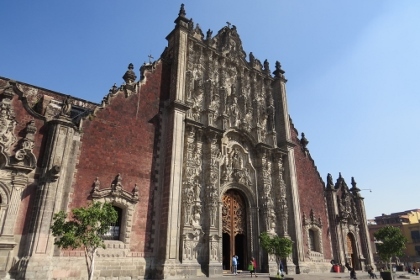 Nearby is the Antiguo Colegio de San Ildefonso which is a tremendous structure filled with Orozco murals. There is a stunning Diego Rivera mural inside as well, but sadly it cannot be photographed. Exhibitions are showcased here, and during my visit there were unique "interactive" statues constructed by Michael Landy. 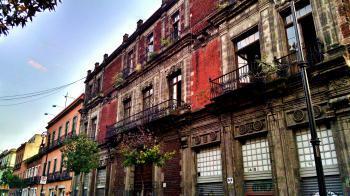 Lastly, I would mention the Gran Hotel which is tucked in a corner of the Zocalo. This hotel has one of the most brilliant glass ceilings I have ever seen. There is also a delicious, though pricey buffet at the top of the hotel, which overlooks the Zocalo. The beauty of the Historic Centre of Mexico City is its diverse array of attractions that go well beyond the Zocalo. From Aztec structures, Diego Rivera & Orozco murals, and countless Spanish colonial buildings - El Centro Historico has a bit of everything. Read more from Kyle Magnuson here. Mexico City's historical zone is the last place I visited during my two weeks trip in this country, with high expectation to see the best of colonial arts in the centre of Spanish Empire in Latin America, my trip turned out to be hard to say. It was really a bad day that when I decided to visit Zocalo square, there seemed to be a demonstration or protest or something, so the police were everywhere blocking the roads and the presidential palace was closed for security reason. Fortunately that the cathedral was still open. The cathedral was really gaudy with lots of gold, especially the altars. Then I went to see Temple Mayor, an Aztec ancient site, while the museum was really good, it could not evoke my excitement, maybe I preferred Teotihuacan more than Temple Mayor. I walked around the city that looks very alike a prosperous European city. From Palace of the Fine Art I walked back to Zocalo again, hoping the situation to be better. The policemen opened more roads, and now I can entered the Zocalo square; I took some photo and did not know what to do more. So I decided to end my city tour and changed to gourmet tour instead! I went to one restaurant near Zocalo, they served really good food from Veracruz State, because of long sea coast and international port, the taste of Veracruzana food is quite different from other area in Mexico, with interesting fresh lime, and chilli pickle. My next spot was the chocolate shop Que Bo. The shop located in the courtyard of one historic building. Visiting this shop really showed me that the richness of architectural building in Mexico City is kept inside the courtyard not the front façade. The chocolate drink I ordered was the interesting iced Hochata with cocoa powder, so good for hot day. And their chocolate was also unbelievable with unique taste likes Pan de Muerta, Mexican Coffee, and many exotic tropical fruits, so good that I bought them all as souvenirs. I continued my food journey to try Mexican wine, taco, and etc. until dinner time! At the end I really had great time in Mexico City but from culinary heritage, not the architectural heritage! The historic complex around Zocalo is a nice place to see; at least it is the must see of Mexico and landmark for souvenir photo, but I would prefer Puebla more than Mexico City, for colonial art. Another thing I would like to point out is that Mexico City is safe, and different from I read in media especially from American reports. The city is indeed very chaotic and full with problem that actually similar to other big cities around the world, but that's Mexican and I really want to come back and see (eat) more. 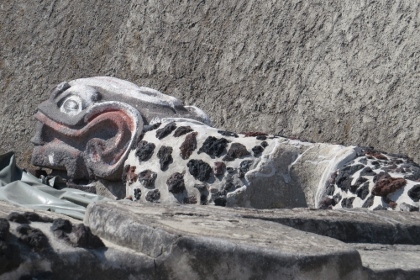 As usual the UNESCO site is opaque about what is encompassed by the phrase “Historic Centre of Mexico city”. The superb Zocalo and its Aztec and Colonial buildings are certainly included and, perhaps more surprisingly, “an impressive series of buildings from the 19th and 20th centuries such as the Palacio de las Bellas Artes” but the exact boundaries of the site are not clarified. No mention is made of the magnificent Diego Rivera Murals in Palacio National (nor indeed is that particular building mentioned by name). Whether similar murals in the Secretaria de Educacion 3 blocks north of the Zocalo are included is not clear. Never mind – there is plenty to see which is definitely included and, even if it isn’t, it is still well worth seeing. As the Palacio de las Bellas Artes does get a special mention you should go inside to see its own magnificent murals and take in a performance in order to se its stained glass stage curtain created by Tiffany. Equestrian Statues: Charles IV (1802), In front of Palacio de Mineria on Tacuba st/Plaza Tolsa (named after the sculptor). 2nd largest cast bronze statue in the World. Saved from melting down during the struggle for independence. Former Islands: The Plaza de la Constitucion area of Mexico City was originally built in 1325 on a the southern part of an island in Lake Texcoco as "Tenochtitlan" by the Tenochca people. The northern part of this island contained the settlement of Tlatelolco, having previously been settled by another Nahuatl group the Tlatelolca - its remains are centred on the "Plaza of the 3 cultures". For many years the lake (whose Aztec controlling dams had been destroyed during the Conquest) was capable of flooding the centre of the city. Drainage was "improved" over the centuries but the problem was not "finally" solved until the 1960s with the building of deep tunnels to take water out of the Texcoco basin -at the cost of aridity/sinking land etc. Pan-American Highway : The Pan-American Highway (as Mexico Highway 85D) enters Mexico City. The Inquisition: "the Holy Office had its own ?palace?, which is now the Museum of Medicine on Republica de Brasil street"
Human Sacrifice: Templo Mayor: Ten Spanish captives were sacrificed at the Temple and their severed heads were thrown back to the Spaniards. (Wiki) Objects associated with human sacrifice are the ?face blades? or knives decorated with eyes and teeth, as well as skull masks. Lenin: Palacio de las Bellas Artes. Mural "Man Controller of the Universe" by Diego Rivera (1934) contains his portrait. The original called "Man at the Crossroads" was designed for the Rockefeller Centre NYC but Nelson Rockefeller wouldn't agree and had it destroyed - replacing it with a portrait of Abraham Lincoln!! John D Rockefeller Jr: John D Rockefeller features prominently in Diego Rivera's mural Man, Controller of the Universe his son initially commissioned it for the Rockefeller centre in New York. Prophecies: Tenochtitlan (now Mexico City) is connected with the prophecy about the white skinned god Quetzalcoatlin who had left Mexico in the tenth century and would return from the east to reclaim his authority over the Aztecs. On Banknotes: US $1000 bill from 1862-1882. The bill depicts US General Winfield Scott entering Mexico City during the Mexican American War, and the Metropolitan Cathedral is in the background. 283 Community Members have visited.